After much trial and error, I've finished basic #ActivityPub support on Write.as! (Though it's not live yet. 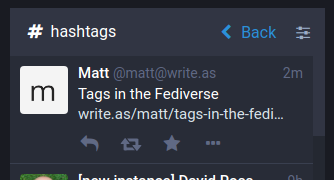 Create a federated blog here, or enable federation by going to your blog's settings > Enable federation.) I'm very, very excited about reaching this point so I can try out some new ideas.